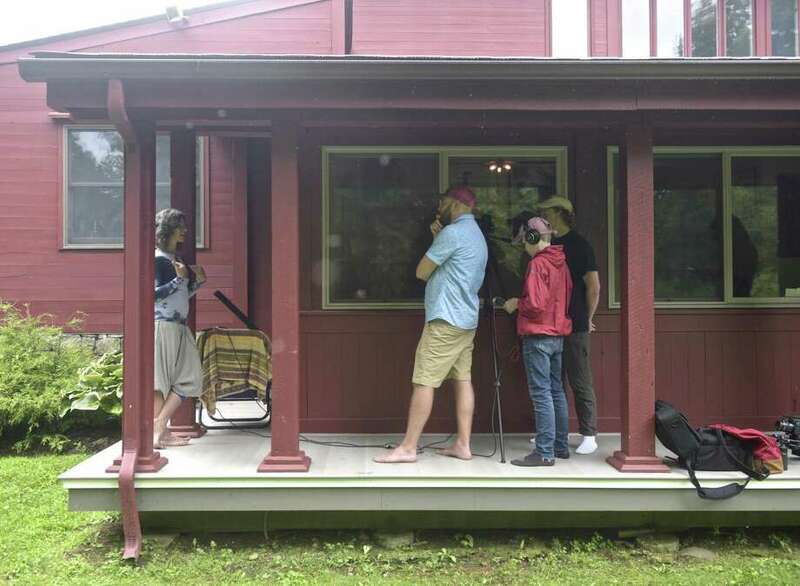 KENT — With a week to go before they would perform in front of a live audience in the Housatonic River, Paula Josa-Jones and her team of dancers spent Saturday afternoon letting local filmmakers in on the final steps of their rehearsals. Paul is one of four dancers and an actress that will join Josa-Jones, the director, in the River Body Project, a dance performance in the Housatonic River accompanied by spoken word to highlight the human and community connection to the body of water. The project will be chronicled in a documentary film by a team of student filmmakers and their teacher from the Marvelwood School film studies program’s first summer edition of the Video Exploration Program, a collaboration between the school and the Upper Housatonic National Heritage Area, which is part of the National Park Service. On Saturday, two of Marvelwood’s students joined teacher Ben Willis to do a final round of interviews with the dancers and film the last of their rehearsals on the nearby riverbanks. Willis said the collaboration between the River Project and the film program happened mostly by happy coincidence. Josa-Jones had contacted the Upper Housatonic National Heritage’s director about her performance, who then reached out to a teacher at Marvelwood, who contacted him, he said. He said the program is meant to help students learn how to make films while getting them out of the classroom. The River Project documentary students are one of two groups making films for the program this summer. The two students helping Willis film Saturday, Cole and Max Branson, agreed that the project has helped them develop new skills as filmmakers, since both of them had never filmed dancers before. Branson said the team ultimately decided on setting up multiple camera angles to capture every aspect of the dance at once. Cole Branson, a sophomore, said he signed up for the project to continue expanding his filmmaking experience. He has been in the film studies program since his freshman year, he said. Other students helping with the documentary include Oliver Sanchez and Maggie Everett. The dance has been in the works for about two years, Josa-Jones said. She came up with the idea after attending a fundraiser for the Housatonic Valley Association and being moved by how passionately the director talked about the river. She said the dance is meant to convey how connected the community around the river is to the water body. Studies show that within 16 days of living on a watershed, she said, the 70 percent of a person’s body made up of fluids is from that watershed. Josa-Jones and her team will debut the performance next weekend with two performances on the Housatonic off of North Kent Road and again the weekend after with two performances on the Shepaug River, a tributary of the river.